The aorta is the main blood vessel that leaves the heart and supplies the body with blood. The abdominal aorta is the aorta that starts below the chest and goes down to the hip area. 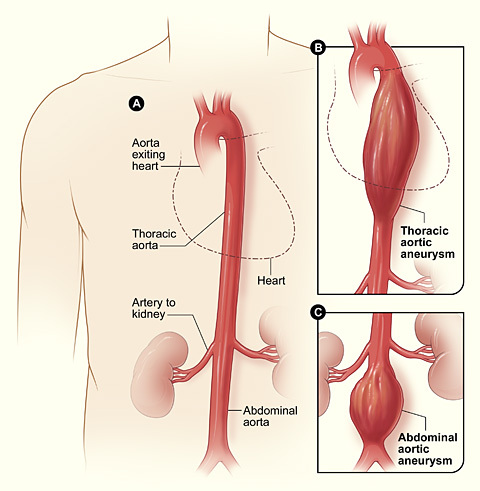 Abdominal aortic aneurysm describes a disease process whereby the abdominal aorta dilates and becomes larger, typically described as over 3 cm. The aneurysm area becomes progressively weaker as it continues to enlarge. The worse case scenario is where the wall becomes so weak that it bursts. Unfortunately rupture of an aortic aneurysm is a catastrophic event with up to 80% of people dying from it. Most abdominal aortic aneurysm occurs in the abdominal aorta below the level of the kidney and are therefore known as infra renal. The risk of an untreated abdominal aortic aneurysm is that is continues to expand end eventually bursts, known as rupture. This usually ends in death. The biggest risk factors for an abdominal aortic aneurysm is smoking. Other risk factors are being male, advancing age and a history of abdominal aortic aneurysm in the family. 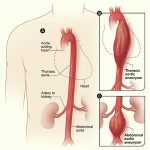 The family history of abdominal aortic aneurysm may also be associated with accelerated growth of the aneurysm. Cigarette smoking is felt to be the most important modifiable risk factor when it comes to abdominal aortic aneurysm. This means that it is a risk factor that is in the hands of the patient and that if stopped would likely result in the decrease of aneurysm formation. Some studies have suggested that smoking can increase the risk of abdominal aortic aneurysm by more than 800%! Importantly, studies have also shown that stopping smoking can decrease risk. The risk is felt to be dose dependent meaning that the more cigarettes smoked, the higher the risk. The risk is significantly higher with non-filter, hand rolled cigarettes. Blood Pressure. Once an aneurysm has developed blood pressure control is seen as key, however having high blood pressure itself is only a small risk factor for the development of abdominal aortic aneurysm. Cholesterol. Cholesterol is associated with development of abdominal aortic aneurysm. 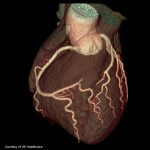 Higher levels of ‘bad’ cholesterol and lower levels of ‘good’ cholesterol have been associated with risk of aneurysm formation. Once plaque has developed in the aorta, the risk of aneurysm formation is also increased. Diabetes. Amazingly, those with diabetes are less likely to develop an abdominal aortic aneurysm. Family History. There appears to be a clear association between family history and abdominal aortic aneurysm formation. Its also been demonstrated that family history of abdominal aortic aneurysm not only increased the risk of aneurysm, but also increased the chance of earlier formation and rupture. The risk seems to be high when a male sibling is involved, but remarkably higher when a female sibling is involved . Natural History – What Happens To Aneurysms Over Time? In general the abdominal aortic aneurysm does not have symptoms, it’s a typically silent disease. If left untreated, and if it grows large enough, it can rupture and lead to a most likely sudden death. Aneurysm rupture is much less likely in those lower than 4-5cm. In aneurysms larger than 7 – 10 cm however, rupture may be greater than 40%. Once an aneurysm ruptures, chance of dying from it is greater than 50%, which is incredibly high. As things stand, guidelines recommend that in most cases the aneurysm be repaired once the size has reached 5.5cm. Studies have looked at repairing aneurysms earlier, in the 4 – 5.5cm range but in general these have found that there is no benefit to be gained from earlier repair as far as open surgery goes. Time will tell whether less invasive techniques will alter that contention. The relationship between size of aneurysm and recommendation to repair is based on these natural history studies. In one study aneurysms between 3-4cm had a rupture rate of less than 1%, those between 4-5.5cm had a rupture rate of less than 3%, but those larger than 5.6cm had a rupture rate of around 25%. This is likely related to the fact that the larger the aneurysm the more likely it is to expand. We have dedicated an entirely separate article for this that is linked here. In women, abdominal aortic aneurysm is less common, but more dangerous, more likely to grow faster and more likely to rupture. The majority of patients with abdominal aortic aneurysm will not have symptoms. In those that do, symptoms may include abdominal or back pain. Some patients may feel a sensation of pulsation on the abdomen. If the aneurysm grows large enough to compress on the veins around it then there may be leg swelling. Sometimes a large aneurysm can compress nerve structures and lead to pain going down in to the legs. Physical exam may detect a pulsatile abdominal mass, however the lack of a palpable mass doesn’t mean there isn’t an aneurysm. In fact physical exam is more likely to miss an abdominal aortic aneurysm than identify one. Rupture of an aneurysm is a major emergency associated with a very high death rate and needs emergent attention. The classic description of this is low blood pressure, pain radiating in to the back and feeling a pulsatile mass in the abdominal area. Ultrasound Scan. Ultrasound scan of the abdomen is the most commonly used method to identify and characterize abdominal aortic aneurysms. Advantages include it is not associated with radiation, it is relatively cheap, and it can provide information on size and other features of the aneurysm. Importantly, they are very sensitive in identifying the aneurysms so that they don’t get missed. CT Scan. CT scanning is basically considered the gold standard of aortic imaging currently. It is the most accurate when it comes to sizing and characterization of an aneurysm. It provides important information regarding associated vessels and other structures. It is the preferred method of imaging when it comes to following post-operatively. MRI Scanning. MRI scanning is an effective method for imaging the aorta also and is comparable to the CT scan in terms of information obtained. One of the advantages of MRI, particularly with regard to surveillance is the lack of radiation. In patients with an abdominal aortic aneurysm who have symptoms that are felt to be related to the aneurysm, repair should be undertaken. Most patients with abdominal aortic aneurysm are asymptomatic however. In those with abdominal aortic aneurysm >55mm, if they are felt to be operative candidates, repair is suggested. 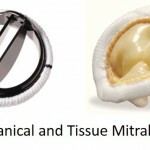 Options for repair are discussed below and include open surgery or more commonly the minimally invasive EVAR procedure. The choice depends on a number of factors that can be discussed by the repairing physician. Sensible decision-making is key. Of course only those who would be felt to benefit from the procedure should undergo it. Therefore those with multiple other medical conditions, or conditions that significantly shorten life expectancy for other reasons may not benefit from the procedure and may have a worse outcome. In those patients with aneurysms approaching 5.5cm, and reasonable life expectancy, physicians should discuss that repair will likely be warranted over the next few years. The repair is typically at the convenience of the patient and it is felt to be safe to watch until the aneurysm approaches the 5.5cm size. In some cases however, a rapid rate of expansion or other high-risk features may mean an earlier repair is warranted. Regardless, follow up and careful surveillance is key. Treatment of abdominal aortic aneurysm is centered on preventing rupture and avoiding associated death. The two treatment options are surgical repair, or EVAR. Surgical repair is a large open surgical procedure, whereas EVAR is a non-surgical minimally invasive approach. No matter which method is chosen, its key to realize the timing of intervention is a balance between the risks of leaving it alone vs. the risk of having a procedure. Of course procedures are associated with significant risk. If the aneurysm is felt to be high risk however, the risk of a procedure can be justified. EVAR being a minimally invasive method is felt to be a method that can minimize some of the risks associated with an open surgery. EVAR has its own clear set of complications however. Although EVAR may have lower short-term risks, the long-term risks are similar to surgery and there is a need for long term surveillance and often repeat procedures. Over the years there have been a number of medicines investigated to potentially decrease the growth rate of aneurysms with the hope being to prevent surgery. Unfortunately, as things stand, there is no proven medicine that fulfills the goal. In general we concentrate on blood pressure control and cardiovascular health in general. I have stage 2 emphysema, inguinal hernia and 5.6 cm abdominal aortic aneurysm. What are my chances? Most abdominal aneurysms can be treated with non surgical methods such as endovascular repair meaning even patients with lung disease can tolerate the procedure.